In celebration of Employee Appreciation Week, running May 6th-10th, we want to recognize our Lake Shore staff who go the extra mile and celebrate the people who keep Lake Shore running. We are seeking parents, students, and employees to submit a story about an employee that did something special! We will share the positive stories, quotes, and compliments from individuals about our employees during Employee Appreciation Week! Please use this form to submit your story of appreciation about one of our employees. The Lake Shore team will be participating in the BT5K Michigan Breakthrough for Brain Tumors Run & Walk, an inspiring and fun event benefiting the American Brain Tumor Association. Our Lake Shore team supports our co-worker and friend, Emily Tims! Emily was diagnosed with Glioblastoma earlier this year and is working with her team of doctors to treat her brain cancer. While Emily is undergoing treatment, her Lake Shore family wants to show her support and raise awareness and money for this great cause. We all miss seeing Emily at school very much and we want her to know how much she is loved and missed! Let's all come together! We would like all of Lake Shore to join this team in support of Emily and the nearly 700,000 people currently living with a brain tumor. You can join our team by clicking on the join button on the right. The Class of 2019 and their loved ones will find it necessary to organize these important event dates into a calendar/planner or an app like Wunderlist/Trello. This link provides information on T3 exams, spirit week, honors convocation rehearsal, cap/gown distribution, honors convocation, senior video presentation, graduation rehearsal, seniors last walk, elementary bus tour, and the commencement ceremony. Lake Shore Public Schools serves 3,516 students in 5 schools which cover a diverse student population. Enroll as a resident or schools of choice student. 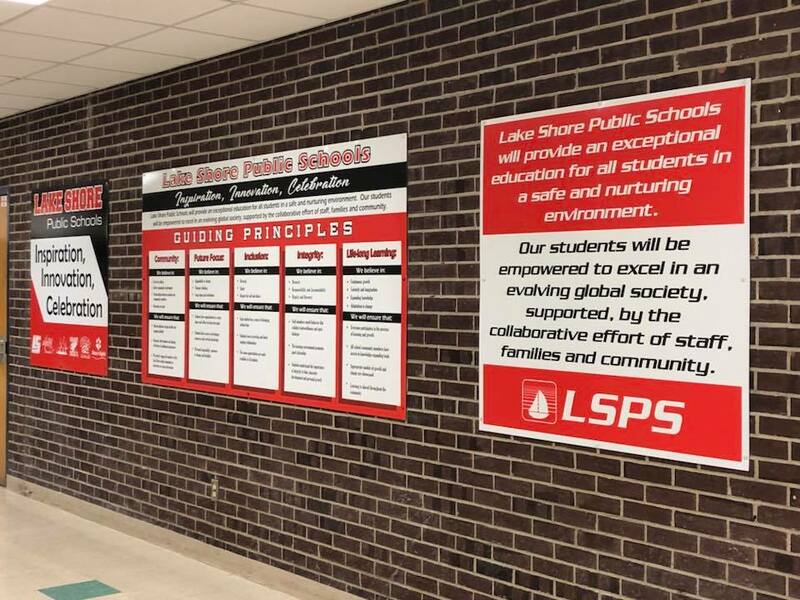 Lake Shore Public Schools is a place of possibilities and a Shorian experience is life changing. Show off your #ShorianPride and check off some of the sweet adventures that Lake Shore has to offer. How many have you conquered? When you enroll in Lake Shore Public Schools, you not only join a prestigious school, but also become part of a family. And when you graduate, your experiences create the launching pad for a successful career. Periodically, we spotlight on our graduates, sharing their accomplishments because we are loud and proud of them. Class of 2015 graduate Mackenzie Nemitz was an active high school student. She even won the title of Most Athletic from her high school peers during the mock election vote. She earned this title as a result of being the Football Manager, basketball player, and serving as our softball team as co-captain. She was passionate about many things, but her claim to fame was softball. This is why she made it official and signed her letter of intent to play softball at the University of Michigan. As a preferred walk-on during her freshman year, she was assured a spot on the team, but unable to be offered a scholarship. This didn’t phase her. Mackenzie continued to train in the sport that she loved and cheered on her teammates from inside the dugout. Tragedy hit her sophomore year as she tore her ACL at the beginning of the season. This forfeited her opportunity for play time. Through adversity, she remained strong. She said, “For the remainder of that season and the next, I focused on recovery and getting my groove back. Overcoming this obstacle, and maturing along the way, was exactly what I needed to progress forward.” Now in her senior year, Mackenzie is in the starting lineup with a batting average of .325. She kept a positive attitude and never let obstacles get in her way of her dreams. This is a wonderful lesson for every Shorian. Although Mackenzie has many role models and motivational people throughout her experiences as both a Shorian and Wolverine, she was asked to name just a few. “Coaches Daly, Puvalowski, and Roehm were always there for her, as a listening ear, giving advice on the field and in life.” Currently Mackenzie is majoring in general studies with a focus on sports management and community engagement. She currently has an internship with the MLB. Thank you, Mackenzie, otherwise known as Cardi Mercury by her teammates, for sharing your story and being an inspiration to all of us. Lake Shore recognizes alumni who bring honor to our school district through work in their career or community. Nominate a graduate to be recognized for significant professional/personal achievements, discoveries, or creative work and exhibiting our core values by sending us an email. Twenty-three Lake Shore participants have chosen to have their hair cut off to help children who struggle deal with the social acceptance often based on their physical appearance. Senior Elizabeth Stacheit has organized and led this kind effort because she wants everyone to feel confident. She began marketing this cause at Lake Shore High School to her peers, and will donate 14 inches of her own hair. At an all-school assembly, volunteers from James Edwards Salon and Paul Mitchell were on stage, scissors in hand, ready to begin the cutting frenzy. Senior Ashley Daniels decided to donate on behalf of her deceased grandmother who battled brain cancer. Ashley witnessed her grandmother's hair loss, a symptom of radiation, while living under the same roof as her since 5th grade. Like Elizabeth, Ashley urges her peers to put others first, and choose to donate. Today we gratefully accepted enough donations to make about 2 wigs! Maggie's Wigs 4 Kids Wellness Center and Salon is a local grassroots non-profit 501(c)(3) organization that provides wigs and support services at no charge to children and young adults experiencing hair loss due to cancer, alopecia, trichotillomania, burns and other disorders. Our wig recipients, also known as Ambassadors, range in age from 3 to 18, and are located throughout Michigan. Students from all walks of life have the opportunity to participate in the Scripps Spelling Bee, one of the nation's oldest and most iconic competitions. In order to select our competitors for the Macomb Regional Spelling Bee, our elementary schools and middle school hold the following preliminary competitions and four students were selected to compete at the Macomb Regional Spelling Bee, held at the Macomb Intermediate School District this past Sunday. Lake Shore’s Aaden Arnold, Michael Keenan, Tyler Pettway, Glendian Vasili competed. The winner, Brendan Pawlicki, is a 7th grade students from St. Lawrence Elementary in Sterling Heights. Glendian lasted until Round 8 with the word samurai. Tyler lasted until Round 7 with the word julep. Aaden lasted until Round 4 with langosta. Michael lasted until Round 1 with the word waywiser. Our spellers share a passion for language, competition and hard work. Thank you for your preparation in an event you will never forget. Earth Day is an annual event celebrated on April 22. Mrs. Manor's First Grade class at Rodgers Elementary read the book Earth Day Everyday by Lisa Bullard as a promotion of environmental awareness. Trina is a concerned Earthling, worried about the way we treat our home planet. She organizes an Earth Day Club that focuses on everyday conservation habits. The project was linked to one of their writing standards of writing informative, explanatory texts. They worked on creating a topic sentence and including some facts about ways to help protect the Earth, focusing on things they could do around their own home, school, or neighborhood to help the Earth. They also worked on several of our Conventions of Standard English standards such as using the correct capitalization, punctuation, and using commas in a sentence. While they were outside for recess today, Makayla Kmetz applied her learning by asking, "Can I walk around the playground to make sure there isn't any litter on the playground?" We challenge Shorian Nation to make every day an Earth Day! Three hundred and twenty-five seniors enjoyed our Adulting Day, created exclusively for the Class of 2019. They engaged in pre-selected three different, one hour presentations to help them think about and prepare for life outside of high school. There were nine class options in total, which included Money Management, Police Interactions, Job Hunts and Interviews, Car Care Basics, Banking 101, MichiganWorks, Introduction to Cooking, Mindfulness, Renting Your First Place. Senior Grace Rudolph enjoyed the Car Care presentation with Lake Shore parent and automotive expert Charlie McCuen. During the presentation, he shared a car maintenance checklist, giving advice about car needs which included oil levels, tire pressure, and brakes. Grace found this to be especially interesting because she has a 2002 Malibu that she would like to keep running for as long as possible. Thank you to C and M Automotive’s Charlie McCuen, MichiganWorks’ Katie and Roshonsa, Orbis Holding Groups’ Amy Wentrack, MSU Extension Program’s Jackie Rabine and Kathy Jamieson, SCSPD’s Chad Hammer, Michigan First Credit Union’s Vicki Armes, Chartwell’s Tina Morris, and Beztak Properties’ Jessica for sharing their expertise with our graduating class. Thank you for attending our annual K-12 District Open House, Art Show and Artisan Market, and College Fair. The hallways and classrooms were filled with demonstrations, cookies, music, mascots, poster presentations, balloons, teacher-led tutorials, technology, and skits. Students prepared the Art Show and Artisian Market exhibit which featured 30 art pieces from each building, giving students a chance to show their talents and growth through drawings, paintings, ceramics, and digital art displays for the community. Over 62 colleges, universities and military branches were in attendance at our College Fair providing information on post-secondary options, and giving Shorians direction for future decisions. The development of language, motor skills, and social-personal skills is a daily focus for our youngest learners at the Shores Child Care Center. Working parents interested in our safe and secure environment were given tours of our facilities and introduced to our curriculum based on weekly themes that are incorporated through art and science projects, games, and language arts. Our student ambassadors, at all levels, explained, through words and works, what it means to be part of the Lake Shore family. Over 100 Class of 2032 students were given a warm welcome at our Kindergarten Roundup event. Our student leaders greeted our future Shorians. The leadership team, comprised of administrators and teachers, deserves credit for the planning of such an exciting event. Students enjoyed the readiness activities, parents felt supported by welcoming staff members, and the energy encouraged smiles. All kids are truly the best part of our schools. At Lake Shore, we pride ourselves in our yellow transportation system. Our 10 bus drivers transport to Rodgers Elementary, Masonic Heights Elementary, and Kennedy Middle School as well as all Athletic events during the school year. They are personable and dedicated to ensuring safety for everyone aboard. According to Transportation Coordinator Sandy Defer, we have accumulated over 62,000 miles since September and will complete over 112 field trip routes, with the furthest being Cedar Point in Sandusky, Ohio or The Pinery in Canada. With a combined 200 years of service and an average 16 years of service, please congratulate our Transportation Department for having all 12 buses meet every safety points and receive a green tag from the Michigan State Police. Note: Each school (LSHS, Kennedy, Masonic, Rodgers, Violet) has a building-specific Events Calendar. Lake Shore Public Schools provides an exceptional education for all 3,516 students in a safe and nurturing environment. Our students are empowered to excel in an evolving global society, supported by the collaborative effort of staff, families, and community. From preschool through our graduating seniors, Lake Shore students are a part of a strong school system that works hard every day for the benefit of our students. Our guiding principles, Inspiration, Innovation, and Celebration, are woven into the fabric of everything we do. Lake Shore offers accelerated learning opportunities starting in elementary school. Students consistently have strong test scores, and teachers utilize the latest technology to track individual student progress throughout the school year. The district currently offers foreign language starting in Kindergarten. Elementary students enjoy daily enrichment opportunities and a full calendar of extracurricular activities. Our middle and high schools are home to award winning athletics and fine and performing art programs. Lake Shore offers dual enrollment and early college opportunities for students free of charge. Macomb County families seeking a quality education for the preschool-11th grade students are invited to apply through our Schools of Choice program, but it is currently closed at this time. Residents may apply using our Resident Enrollment process. As the Class of 2019 counts down the days until graduation, photos will be taken, memories will be made and preparations for the future will be set in motion. Congratulations to our 325 Senior graduates featured on our Instagram account. At Lake Shore, school safety is a high priority and promote resources that help us to accomplish that goal. OK2Say encourages confidential tips on criminal activities or potential harm directed at students, school employees, or schools.